Ludivine, the Hound Dog Half inspiration. Beautiful, CERTIFIED (USATF #AL15062JD) half marathon through the rolling hills of Elkmont, Alabama. The course begins in downtown Elkmont and heads out into the country on the rolling rural roads. 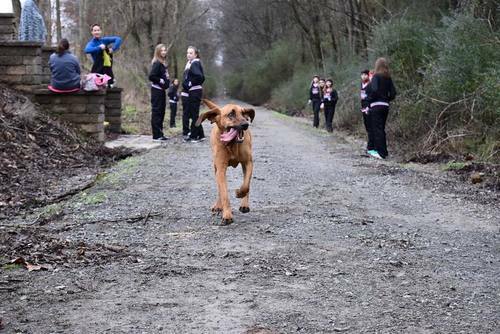 About 7-8 miles into the race, runners will move off the road and onto the old L&N Railroad bed and is now known as the Richard Martin Trail and is part of the Rails to Trails Conservancy, where they will run the final 5-6 miles of the half marathon. Spectators welcome to come cheer the runners. No charge. Elkmont is located in the Huntsville & Decatur Region of North Alabama. Be sure to check out places to Go, Eat, Stay, and other events in Elkmont.